Amazon: This power-foods healthy-living guidebook will inspire readers to eat well, lose weight, and embrace food as medicine. “Food as medicine” is a powerfully healing way to eat and was embraced by nutritionist Jennifer Adler as she recovered from a malnour­ished childhood and adolescence. Part power-foods cookbook, part handbook for healthy living and eating, and part memoir, Passionate Nutrition provides digestible information, tips, and techniques for how to find your way to optimal health. She focuses on abundant eat­ing (as opposed to restrictive eating), and explores what she calls “the healthy trinity”—digestion, balance, and whole foods. Adler guides and encourages readers to shift their diet to achieve this desirable bal­ance, introduces power foods we should all eat, and provides healthy ways to lose weight, along with simple recipes to optimize health. 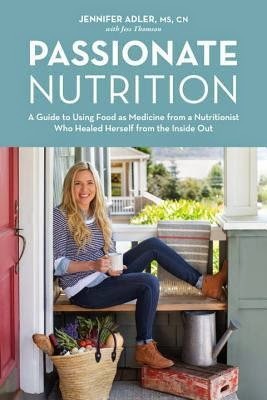 With her personal story interwoven, readers will be inspired to embrace the healthy power of food. Kritters Thoughts: What a positive take on nutrition and health! Jennifer Adler starts her book with her story which didn't start out in the must nutritious of ways (which gives hope for the rest of us!). Then she talks about all the different things that good food can help you do better. I love books with practical advice that I feel like one trip to the grocery store could help change a few things and then little by little could make my eating and things better. I made a list on my phone of the power foods that she suggested and have purchased two and incorporated them into my daily/weekly routine. Kafir and miso. I heard about Kafir before from a co worker and how it helps with digestion and such and purchased just one bottle and take a healthy swig at night and I actually see a difference! Miso - not a purchase for the home, but have since reading the book, tried to have two bowls of miso soup a week and I love the soup, but am still working on getting into the home and into the routine. I don't feel overwhelmed and after tackling these two am ready to add some more things to the list to build a healthier pantry and fridge! As a side note, I read this book in early December to allow me some experimental time to give you some results. I am hoping to scatter some Passionate Nutrition updates throughout the blog this year and hopefully see my general nutrition take an upswing in 2015!